When looking for something that would look good around a pool or for relaxing outside, I found these sets of family leisure garden patio furniture from Walmart.com. Not having seen this kind of sets before I wanted to know more about them. I will share what I have found, these sets include two chairs, two ottomans and a side table. If you need extra seating you just can use the ottomans. The tables in these sets are just side tables not quite big enough for a meal, great for sitting your drink while you talk or just soak up the sun. No umbrellas can be used in this size of table, if you want information on an umbrella that will work, look at my suggestions here. If you are looking for something different, follow along as I give the details of these 6 examples of leisure sets. Look at the bottom of each item description for my opinion of the best features of each set. This set this has the resin wicker look. If you have other wicker furniture or like the style this is the set for you. This set has steel frames with woven resin wicker on the back of the chairs and the skirting of the chairs and ottomans. The ottomans can slide under the chairs when not needed for more outside space. The chairs are 27 inches deep, 28 inches wide and 32 inches tall. They will support 225 pounds each. Assembly is simple as you have to just attach the base with legs to the back piece. Add the blue cushion and back pillow. The ottomans are 19 inches deep, 18 inches wide and 13 inches tall. Ottomans come assembled, just add the cushions. The round top table has a safety glass top insert. It is 18 inches across and 19 inches tall. Table legs come in two sets, attach one to the top and then the other. Turn over and install the glass insert. Cushions are polyester filling and material. They are treated for UV protection and water, stain and mildew resistant. 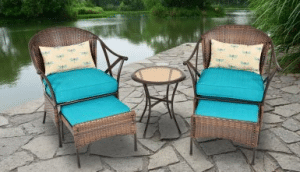 If you like the look of the resin wicker, this set is for you. This is the only set where the ottomans can store under the chairs when not needed. You can get this set with tan cushions also. If you are looking for motion chairs for you leisure set, this set will have a gentle back and forth motion. I have a set of metal chairs with this motion and they are very comfortable for long term sitting. The square side table has a slate tile top insert. It is 18 inches across and 20.25 inches tall. Assembly will require the two sets of legs to be installed in the proper order. The tile insert has rubber bumpers in the corners that will need to be installed before final assembly. The ottomans are 22 inches deep, 18.25 inches wide and 13 inches tall. No assembly required, just install the cushions. The chairs are 26.5 inches deep, 24 inches wide and 34 inches tall. The seat is 14.5 inches form the floor and 22.5 inches square. They will hold 225 pounds each. Assembly is simple, just slide the spring on the seat portion into the base and install holding nut. Add cushions and pillows. Cushions and pillows are made from a polyester material. If you are looking for a leisure set with motion, this set will work for you. I have information on a fire chat set in this collection here. 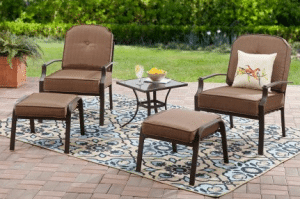 Looking for the comfort of a leisure set with swivel rockers, the Douglas Lane set will work best for you. With a dark brown powder coated finish on the aluminum frames, the tan fabric of the cushions will give you a nice contrast of color. Add some color with some throw pillows to match other outdoor decor (not included in this set). The square aluminum table with a slat type design in the top. It will be 24.5 inches square and 20.5 inches tall. Assembly will just require the installation of the two sets of legs in the proper order. The chairs are 24.5 inches deep, 29 inches wide and 35.75 inches high. They will support 225 pounds each. Assembly will involve attaching a bracket to the bottom of the seat. This bracket will slide into base to let the chairs swivel. Add cushions. The ottomans are 21 inches deep 21.75 inches wide and 14 inches high. They will support 225 pounds for extra seating. No assembly required, just add cushions. The cushions for this set have corner piping, foam with batting with a Olefin fabric cover. All cushions are 3 inches thick for your seating comfort. 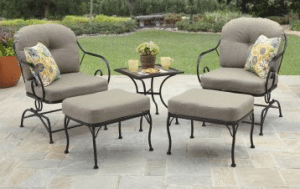 If you want an aluminum frame or swivel rockers the Douglas Lane leisure set is for you. This set is lightweight and has very thick cushions for long term sitting comfort. This set has round top cushions with a center button on the back for the look of fine indoor furniture. The square glass top table will give this set a high end look also. The dark carbon powder coated steel frames will make this set very sturdy. The table is 20 inches square and 18.5 inches tall. The top is made of tempered glass for safety, it is painted a color to match the steel frames and is built into the top frame. Assembly will require to turn top upside down, insert legs into corners and then attach the square center support. Make sure you do final tightening when standing on the feet as this will help in the stability of the table. The chairs are 31.5 inches deep, 26.5 inches wide and 29 inches tall. They will support 250 pounds each. Assembly of the chairs will take attaching the seat frame to the back of the chair, the next step is to attach each arm with front leg piece. Add cushions and Velcro in place. The ottomans are 23.75 inches deep, 26 inches wide and 15 inches tall. Assembly will require you to attach each set of legs to the seating portion of the ottoman. Add cushion and Velcro in place. The cushions are made of a polyester material rated for outdoor use, I would still store when not in use for a longer lifespan. With the round top backs and center button, this set has the look of a very expensive sitting set. There are many more sets and individual pieces for this collection, see my information on the bar height bistro set here. Simple straight chairs with a sling material for all seating areas, this fabric is very durable and easy to keep clean. The sling fabric comes in two colors to match your outdoor decor, tan (shown) and brown. The frames are steel with a dark brown powder coated finish to prevent rust. The square table has a ceramic top that is four pieces of tile that inserts into the top, you can change the tile to change the color pallet of this set. Table is 21 inches square and 18.5 inches tall. Assembly of the table will require the top to be placed upside down, insert the four legs into the corner and then attach the square center support. Turn table on legs for final tightening, install the rubber bumpers for the tile and then add the tiles. The chairs are 26 inches wide, 31 inches deep adn 36 inches tall. They will support 250 pounds each. Assembly will take attaching the seat portion to the back, then attach each arm/front leg assembly. I have a set like this and the holes sometimes do not line up for assembly, you may have to adjust when putting together. The ottomans are about 21 inches square and 13 inches tall. Assembly will require each set of legs to be installed and you are ready for use. The sling fabric is a polypropylene covered polyester material. I find this material very durable in outdoor conditions. It dries very quickly and needs little work to keep clean. This set will dry quickly after rain or getting wet from the pool, easy to keep clean. Very light weight, can be moved very easily. No cushions to store. This set will assemble very fast if holes line up. Table top color can be changed. 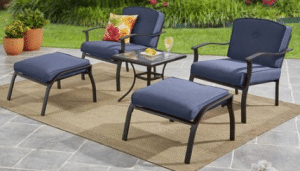 This set comes in four colors (tan, blue, red and green) to match many outdoor decors. The frames are powder coated a matte carbon color on the steel to help prevent any rust. Square table has a tempered glass built into the top frame. Table is 20 inches square and 18.5 inches tall. Assembly will require the top to be upside down, insert legs into corners, then attach the square support to the legs. Tighten when on the legs for the best leveling of table. The chairs are : 27 inches wide, 31.5 inches deep and 29 inches tall. They will support 250 pounds each. A sling base will support the seat cushion. Assembly will require the seat portion to attach to the back, then the arm/front leg assembly to be attached on each side. Add cushions, Velcro in place and you are ready to use. The ottomans are : 23.75 inches deep, 26 inches wide and 15 inches high. Assembly will require each side leg to be attached to the seat base, add cushions, Velcro in place. The cushions are made from a polyester fabric material, storage is suggested when not using. 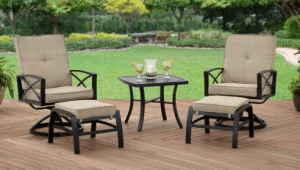 If you have a need for seating around the pool or just fro relaxing in your outdoor space, on of these sets of family leisure garden patio furniture will work well. Each set will have its own properties, you will have to see what works best in your outdoor space. I have given my best features for each set at the end of their description, if you have any other questions about features send me an email and I will return my input. If you have any comments please use the forms below. Don't forget to share with your social networks if you found this information helpful. There are some affiliate links in this article. If you use these links I may make a small commission. I’ll be looking for a place of my own soon, and outdoor space is a definite must have. I’m glad I stumbled across this post because I’m sold on the Mainstays Wentworth 5-Piece Leisure Set. It’s simple and cute and perfect for my style. Thanks for the info! 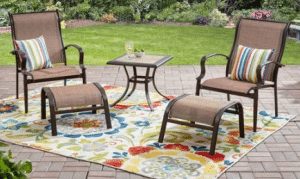 These sets will make your outdoor space a place you will want to go after a long day at work. Simple places to sit and relax without having an expensive sitting sets. There are some great options here! I love how each chair combo includes thorough information, which definitely helps when shopping and making decisions. I’m always thinking of new ideas for my outdoor spaces. Comfort, style, and colors are a few things I think about for each space. The options on this page include all of this information. Thank you for sharing! I am glad you like all of the options that are available in these sets. Nice selection of patio garden furniture. Thank you for the helpful details on the patio sets. I like the color options–I tend to like colorful furniture instead of the standard tan and brown. Most tans and browns will go with any outdoor decor, but are just plain. I like to add some color with throw pillows or a colorful umbrella. Some of these sets will let you change the look of your outdoor space with little effort. Thanks for the good description of these sets. I like the myrtle creek set.Did I pick the most expensive set? I like the Myrtle Creek set also, it is not the most expensive of these sets. How much is the Myrtle Creek set? And where do you buy it? Price is $322 at Walmart. Follow link on this post. If you reside outside the US you may find on Amazon.